Sony is unveiling two new CineAlta™ 4K cameras, complemented by a full line-up of new accessories. 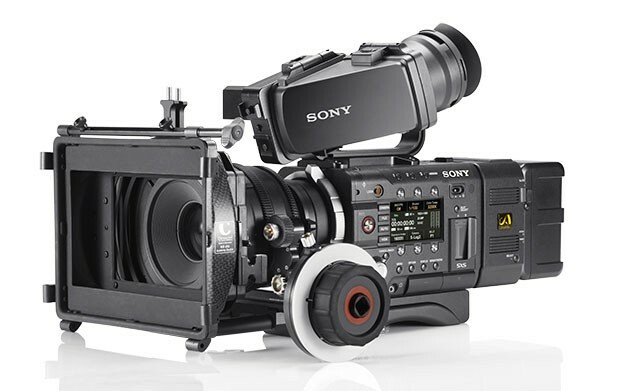 The new cameras, the PMW-F55 and PMW-F5, fill a critical gap in large-sensor acquisition between Sony's PMW-F3 camcorder and its F65 CineAlta Premium 4K camera, giving content creators new levels of flexibility and creative options for HD, 2K or 4K acquisition and production. With a modular and compact design for easy configuration, each camera features a new type of 4K Super 35mm image sensor with a 4096 x 2160 resolution (11.6M total pixels). The 20 megapixel F65 remains the flagship of Sony's large sensor camera family. The 8K sensor-equipped F65 continues to evolve, with new features designed for the most demanding high-end imaging applications. These features include a new high frame rate mode for 4K RAW recording at 120P to deliver stunning 4K images with super smooth slow motion capabilities, and image capture using the SR codec at 12-bits. Future updates to the F65 will deliver 6K de-mosaicing, along with other major new features. The new PMW-F55 and PMW-F5 CineAlta 4K cameras deliver unprecedented creative options for HD/2K/QFHD/4K (PMW-F55) and 2K*/HD (PMW-F5) production. Both offer multi-codec support featuring Sony's new XAVC MPEG-4 AVC/H.264 format, the SR codec (MPEG4 SStP) and the industry-standard High Definition XDCAM 50Mbps 4:2:2 codec. In-camera recording is on Sony's New SxS media, SxS PRO+ (Plus ) – which can be used to record XAVC in HD High Frame Rate and in 4K at up to 60fps (in the PMW-F55), and XAVC HD High Frame Rate in the PMW-F5. In addition to on-board recording onto SxS PRO+, the PMW-F55 and PMW- F5 can also be connected to the new AXS-R5 RAW recorder. Slow-motion imagery at up to 240fps** (PMW- F55) and up to 120fps** (PMW- F5) can be captured as 4K RAW files on newly developed AXS memory. The PMW-F55 features a global shutter to eliminate rolling shutter skew and flash band, and features a wider colour gamut for exceptional colour reproduction. The cameras are further distinguished by wide (14 stops) exposure latitude, high sensitivity, and low noise. The PMW-F55 can connect to the new 4K 30-inch LCD monitor, PVM-X300, using four 3G-SDI interfaces to monitor pictures at 4096x2160 resolution at up to 60p, while recording and playing back XAVC 4K images. Similarly, it is also possible to connect directly to the 84" BRAVIA 4K LED TV for large-screen monitoring of the camera's 4K 60P images (at resized horizontal resolution of 3860 pixels). 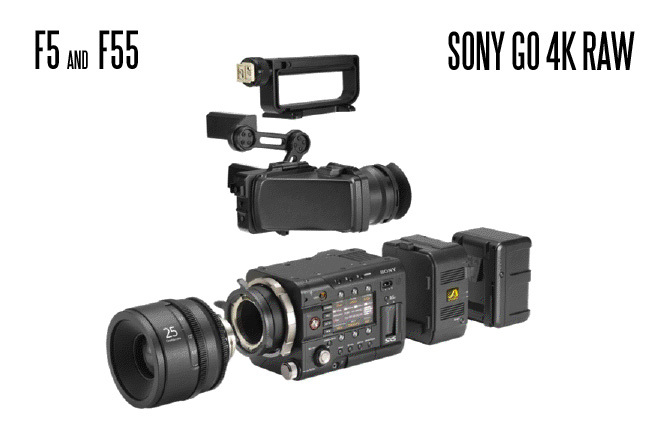 The PMW-F55 and PMW-F5 cameras continue Sony's efforts to offer the most flexible lens options. A PL-mount lets users choose cinematic lenses from suppliers such as Angénieux, ARRI, Canon, Carl Zeiss, Cooke, FUJIFILM and Leica. Sony is also launching a second generation of cost-effective PL mount prime lenses. Each is certified for 4K capture, and is designed to minimize geometric distortion, vignetting and breathing. A 9-blade iris delivers beautiful bokehs and the focus rings rotate 240°. The new lens series includes focal lengths of 20, 25, 35, 50, 85 and 135 mm. For easy lens changes, each has the same T2.0 aperture, the same external diameter, matte box diameter, and gear locations for follow focus and aperture. All are the same height except for the 135 mm lens. Using a new digital interface, PMW-F5 and PMW-F55 users can take advantage of a new series of high-quality OLED and LCD viewfinders. The DVF-EL100 OLED viewfinder measures 0.7-inches with 1280 x 720 HD resolution, superb brightness, contrast and response. The DVF-L350 3.5-inch LCD viewfinder offers 10 times the contrast of previous Sony LCD viewfinders, with a flip-up eyepiece for direct monitoring. 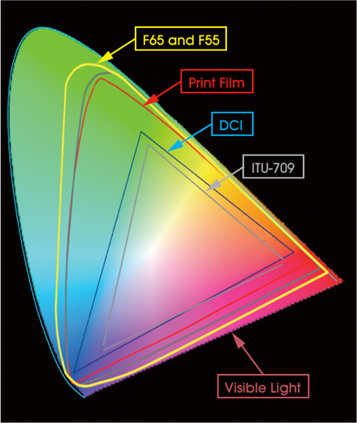 A third option is the full HD DVF-L700. This compact 7-inch LCD viewfinder enables high resolution when shooting in 2K and 4K, with pixel-to-pixel 1920 x 1080 representation of HD images. Sony is also unveiling the AXSM™ Access Memory System for 2K*/4K RAW recording, based on Sony's unique recording technology. Optimised for this new platform is the AXSM memory card (512 GB capacity, model AXS-512S24), using the generic file system exFAT. Users can record 4K RAW data up to 60 fps and 2K RAW up to 240 fps**, with a 300MB/s sustained transfer speed. PC-friendly operation is enabled through use of the AXS-CR1 card reader, offering a USB 3.0 interface for high speed transfer. Additionally, the new AXS-R5 RAW recorder directly docks onto the PMW-F5 and PMW-F55, for an extremely elegant and compact recording system for 2K** and 4K RAW recording. The cameras support Sony's new high-speed, enhanced versions of its SxS PRO memory cards: the "SxS PRO+(PLUS)" series (in 128 and 64 GB capacities, models SBP-128B and SBP-64B). Based on the format long used in Sony's XDCAM EX camcorders, the cards support XAVC 4K and XAVC HD high frame rate recording, and can be directly inserted into the cameras. The PMW-F5 and PMW-F55 cameras take advantage of Sony's new BP-FL75 battery pack, which uses Olivine-Lithium Iron Phosphate-instead of conventional Lithium Ion cathodes. The result is a substantial increase in charge-discharge cycles, compared to previous Sony batteries. The Olivine battery works with Sony's BC-L90 quick charger. The new battery supports outstanding mobility for on-set shooting enabling two times higher speed charging than current chargers and a maximum 150 minutes of consecutive shooting. The PMW-F5 and PMW-F55 cameras are also compatible with Sony's BP-GL95A, GL65A, L80S and L60S batteries, which use the BC-L70 and L160 chargers. Delivering advances in ergonomics specifically requested by cinematographers, the PMW-F5 and PMW-F55 feature Sony's newest shoulder rig for extra stability and comfort. The rig is sturdy, lightweight and uses industry-standard rosettes on both sides for quick and easy attachment of third-party hand grips and other accessories. 2K/QFHD for PMW-F55 and 2K for PMW-F5 will be available with firmware version up. **High frame rate higher than 60fps will be available with firmware version up. I assume that the Red part is a joke. Or at least that hasn't happened quite yet? I'm actually more interested in their "cost-effective PL mount prime lenses" rather than a 50K-100K camera that I'll never get to use. Sorry, could not resist, as I so much hate their bad treating of poor lemmings. Sony just outplayed this motherfuckers, getting pause on price announce (before final shmack), so this time they are in strange position. is there any reliable information about pricing esp. for the AXS-R5 RAW recorder? I heard horrible rumors. Great work Son(n)y Boy! We'd better get down put some heart into stories that flow into these gadgets, eh?! I really hope RED can respond to this "throwdown" by Sony, starting with their prices. I respect that RED is a Made in the USA operation, I wouldn't want them to go bankrupt or anything close to that. All I know is that one of the highest quality Blu-rays I have ever seen was shot with a Red camera. If you ever have an interest in seeing a really high quality climbing Blu-ray check out Chuck Fryberger's stuff. The Core and the Scene Blu-rays were very high quality films. It only ships with XDCAMHD50. This is less than the GH3 or a hacked GH2. The other codecs are "future upgrades". Also to shoot RAW, you will need an external recorder and upgraded firmware. All the codecs, RAW support, and RAW recorder will cost money. This will end up being at least a $60,000 camera if you want all the bells and whistles. I don't think RED has anything to worry about in the Scarlet market, but the Epic market is a different story. I want to see footage. Well, even if RED may just have been good for kicking some as…s, it would have been necessary. Not so long ago Sony sold F23 for a quarter million, saying 2/3 is good enough for cinema, only to make it obsolete by quietly preparing the F35 with Panavision Genesis. I have seen companies going bankrupt over this policy! You are correct, I sometimes forget they still make camera's that are 420, so I forgot the GH3 and GH2 were only 420. Regardless XDCAMHD50 422 in my opinion is too compressed. I personally believe the most compressed codec on any camera should be 100mbps 422, and that should be used for events and stuff like that. Anything more serious should be in the ball park of 200mbps and up in RGB or 100mbps and up in RAW. Now I get why Red drops Epic and Scarlet price from November 1st. I thought it was because of BMCC. Not only. The competition is becoming tight. That's a good news. But even better is that The Holy Global Shutter is finally coming. That's major. The only question is how long it will take for it to shed its divine light onto the prosumer/consumer market? Remember, there is also the 4k RAW upgrade for fs700 coming out.. including a recorder for 2k$. So that´s the product which competes at the price point of scarlet and "canon cinema". I´d be very happy to rent an f55 with recorder. Makes one think that Sony has all this technology planned/developed but are holding onto it and only releasing it when they please, or when they need to counter another manufacturers product. I guess they all do that to some extent, pretty smart business practice. @Brian202020 someone close to Sony told me that the updates would be free. The external recorder is something else. what about this versus the upcoming BMCC??? @flaschus different entities, no? Both gives raw, that much is true. However, you get 4k and a bunch of additional options with these Sony cams. f55 is a 14 stop cam with global shutter, mind, first of it´s kind I believe? It really pushes the envelope when it comes to the elusive global shutter and dynamic range. @flaschus the BMD has RAW recording in 24/25/30p with a small sensor. - that's it. And also I would suspect that we will see these Sonys recording when most of the people are waiting for their preordered BMD cams. JVC also have a new full frame high end camera coming December, this will give us a great selection of tools to choose from. From a production POV, I am looking to upgrade my current cameras which have served me well. I will be purchasing a GH3, BMCC, and F5 complete, this will give me a camera for every situation I require and is extremely cheap when you consider the price of high end cameras >3 years ago. The F5 is extremely versatile and being modular it will not become obsolete overnight. I do love RED camera, but seriously they will fade away within 2-3 years as all the major players start to roll out 4K/5K/8K cameras way cheaper with superior options to what RED can produce. How many of you still have a 35mm letus/Red Rock adaptor sitting on the shelf, I must have spent over 10k on this technology trying to get the DOF look, now I can buy a BMCC/ Scarlet plus extras for this. The game is about to change very quickly so anyone thinking of taking a mortgage for a RED Epic/scarlet package needs to really do there homework.. Very important is how SD card speed will be progressing. As it could be that within 2 years we'll see raw camera that writes to one of two SD cards. Also 1.8" SSD market is growing fast.